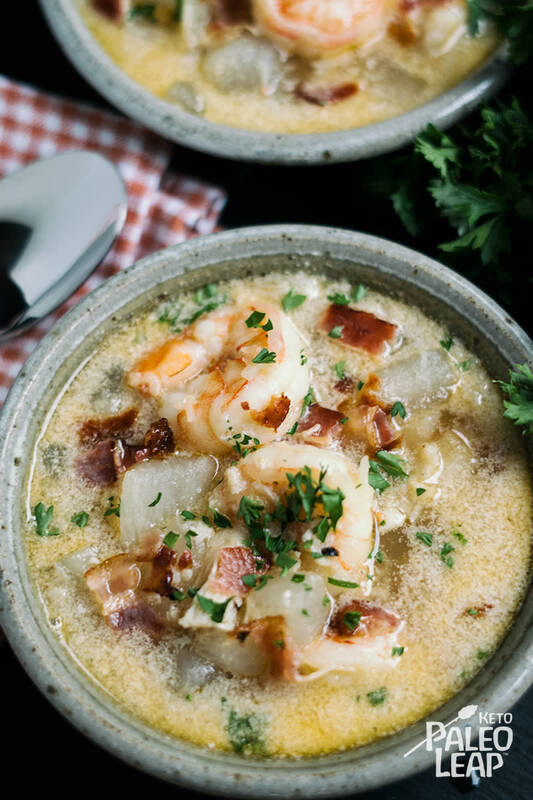 At first glance, you may ponder the flavor combination of seafood and coconut milk, as it may sound strange to your unaccustomed ears, but trust in kitchen-tested Paleo chowder recipes – your tongue will instantly recognize what tastes exceptionally great. What’s more surprising here, is the absence of potatoes or sweet potatoes – the carbs which usually replace the gluten flour in a “real” chowder. But what we are making here really is real, and perhaps it is even the true one, we’ll let you decide for yourself. What low-carb vegetable can you add to your soup, so that it feels like you are ladling the real thing into your chowder bowl? A daikon radish. Quick side note: this radish can also be chopped up and baked into fabulously crispy low-carb fries. Here, it goes in the chowder, chopped into bite-size pieces – it is the perfect potato substitute! It has loads of potassium, phosphorus and vitamin C, plus it improves digestion, reduces inflammation and strengthens your immune system, what’s not to love about it? If you are familiar with Asian cuisine, then it is likely you’ve tried a daikon radish before (maybe you didn’t even know it), if not, here is a great place to start. It is also good to know that daikons can be eaten raw, so if you would like to serve a small salad before the soup, slice it up thin and add the extra to a radish and cucumber salad. Dig in and get healthy! Add the shrimp to the pot and cook until pink, 2 to 3 minutes per side, set aside. Add onion and garlic and cook 3 to 4 minutes, stirring frequently. Place the chopped daikon in the saucepan and cook everything for 4 to 5 minutes. Add in the fish and cook 2 to 3 minutes, pour in the fish stock and stir – scraping the bottom of the pan. Add the shrimp back to the pot with the crab meat, cover and simmer 12 to 15 minutes. Pour in the coconut milk and season to taste. Serve the chowder topped with sliced bacon.